Prostate cancer (Gleason score 5+4=9) with metastases to the vertebral bodies. 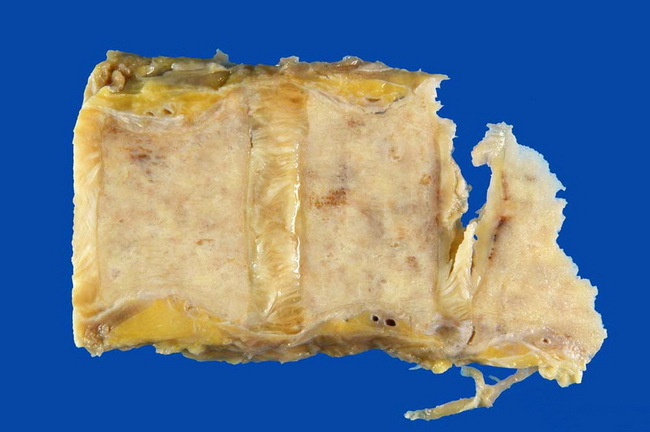 The bone appears compact due to diffuse infiltration by prostate cancer. In widely metastatic prostate cancer, the bones of axial skeleton and pelvis are commonly involved. The metastatic deposits are osteoblastic, although they can sometimes be lytic or show mixed pattern.